Cisco and Huawei, as the world’s largest communications equipment makers, have their own network hardware lines and IT solutions for different network demands. They have different backgrounds, policies, services and info systems, etc. so it’s not easy to compare the Cisco hardware to the Huawei’s. But we can make it simple, because Cisco hardware, no matter the routers, switches, or access points, most of them are similar to Huawei’s routers, switches and access points. So in the following table, we make a simple Model Comparison of Cisco 3750-X/3560-X and Huawei S5700 Series. 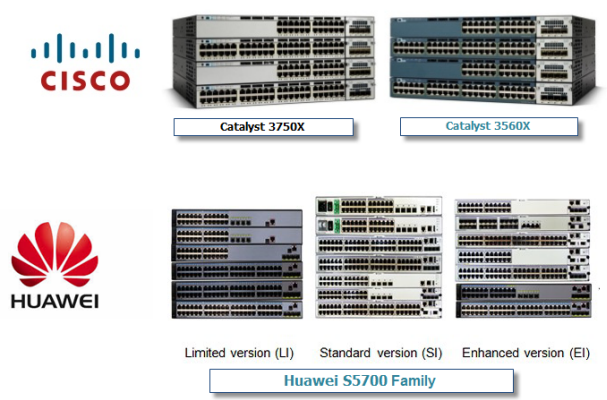 You can see each Cisco Catalyst 3750-X model and 3560-X model, is similar to a S5700 model, or is equivalent to one of Huawei S5700 models. Let’s have a look.